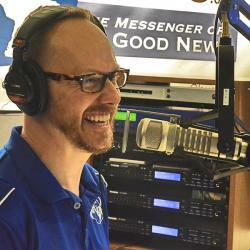 Jonathan Schkade, freelance editor and writer, talks about how to teach children the not-so-nice stories in the Bible. These stories aren’t always very easy or comfortable to work through, but Jonathan explains why they’re still important and gives tips on how to teach them. Learn more about Jonathan and his books Not-So-Nice Bible Stories: Gory Deaths and Icky Sticky, Hairy Scary Bible Stories on his website jonathanschkade.com. Purchase both of these books and more by Jonathan at cph.org. Brenda Trunkhill, editor for Concordia Publishing House, talks about unique ways to celebrate baptism birthdays throughout the year. Remembering our baptisms is a central part of the Christian life, but why celebrate it with just balloons and a card when you can celebrate with meaningful games and activities! Brenda also talks about how to incorporate these ideas into a classroom setting and how to encrouage kids to celebrate even when they think it’s silly. Two books Brenda recommends to give to children are God Chose You for infants and God Makes Me His Child in Baptism for young children who are baptized or siblings of those being baptized. Thy Strong Word - Exodus 26: "The Tabernacle"